Titan A.E. is a 2000 American animated post-apocalyptic science fiction adventure film directed by Don Bluth and Gary Goldman and starring the voices of Matt Damon, Bill Pullman, Drew Barrymore, John Leguizamo, Nathan Lane, Janeane Garofalo, Ron Perlman, and Tone Loc. Its title refers to the spacecraft central to the plot with A.E. meaning "After Earth". The animation of the film combines 2D traditional hand-drawn animation with the extensive use of computer-generated imagery. Produced by Fox Animation Studios as its second and final film and project, the film was theatrically released on June 16, 2000 by 20th Century Fox in the United States. The film received mixed reviews from critics and is a box office bomb, as it grossed $36.8 million against a $75–90 million budget, resulting in a $100 million loss for 20th Century Fox. In 3028, humanity has mastered deep space travel and interacted with several alien species. A human invention called "Project Titan" alarms the Drej, a pure energy-based alien species. As the Drej start to attack Earth, Professor Sam Tucker, the lead researcher for "Project Titan", sends his son Cale on one of the evacuation ships with his alien friend Tek while Tucker and other members of his team fly the Titan spacecraft into hyperspace. The Drej mother ship arrives and fires a directed-energy weapon into the planet that completely destroys Earth, while debris from the explosion also destroys the Moon. The surviving humans become nomads, generally ridiculed by other alien species. Fifteen years later, Cale works at the salvage yard in an asteroid belt called Tau 14. He is tracked down by Joseph Korso, captain of the spaceship Valkyrie. Korso reveals that Tucker encoded a map to the Titan in the ring he gave Cale. Tek tells Cale that humanity depends on finding the Titan. When the Drej attack the salvage yard, Cale escapes aboard the Valkyrie with Korso and his crew: Akima, a human female pilot, along with Preed, Gune, and Stith, aliens of various species. On the planet Sesharrim, the Gaoul interpret the map, and discover the Titan hidden in the Andali Nebula. Drej fighters arrive, capturing Cale and Akima. The Drej eventually discard Akima and extract the Titan's map from Cale. Korso's crew rescues Akima, while Cale eventually escapes in a Drej ship, and rejoins the group. Cale's map has changed and now shows the Titan's final location. While resupplying at a human space station called New Bangkok, Cale and Akima discover that Korso and Preed are planning to betray the Titan to the Drej. Cale and Akima manage to escape the Valkyrie, but they are stranded on New Bangkok when Korso and the rest of the crew set off for the Titan. With the help of New Bangkok's colonists, Cale and Akima salvage a small spaceship named Phoenix and race to find the Titan before Korso does. Cale and Akima navigate through the ice field in the Andali Nebula and dock with the Titan before the Valkyrie arrives. They discover DNA samples of Earth animals, and a pre-recorded holographic message left by Professor Tucker who explains that the Titan was designed to create an Earth-like planet. However, due to its escape from Earth before its destruction, its power cells lack the energy necessary for the process. The message is interrupted by the arrival of Korso and Preed. Preed reveals himself to be a mercenary for the Drej and betrays Korso while holding him, Cale, and Akima at gunpoint. Preed attempts to kill all three of them for the Drej, but he is killed by Korso. He and Cale then fight and the captain is put out of commission, at least briefly. Moments later, the Drej attack the Titan. Given the fact that Drej are, essentially, beings of pure energy, Cale realizes that modifying the Titan to absorb them will re-energize the ship. In order to put this plan into effect, Cale must repair significant parts of the ship; he sets off to do this while the remaining crew of the Valkyrie distract the aliens. Korso shows up and, to Cale's surprise, helps stall the Drej and then sacrifices himself to complete the repairs. The Titan absorbs the Drej mothership along with everything aboard, and uses this gained power, along with the ice field, to generate a new, habitable planet. Cale and Akima stand in the rain, gazing at the beauty of their new home and discuss what this planet should be called. Stith and Gune do a fly-by on the Valkyrie as colony ships, filled with humans anxious to start life anew, approach. Matt Damon as Cale Tucker, a yard-salvager who carries the map to Titan in his ring. John Leguizamo as Gune, an amphibian-like Grepoan and Korso's chief scientist. Nathan Lane as Preedex "Preed" Yoa, a fruit bat-like Akrennian and Korso's first mate. Janeane Garofalo as Stith, a kangaroo-like Sogowan and munitions officer of the Valkyrie. Drew Barrymore as Akima Kunimoto, pilot of the Valkyrie and Cale's love interest. Ron Perlman as Professor Sam Tucker, Cale's father who helped develop Project Titan. Tone Lōc as Tek, Sam Tucker's blind alien friend who raises Cale while Sam is away. Jim Breuer as the Cook, a cockroach-like alien who works at Tau 14. Christopher Scarabosio as Queen Susquehana of the Drej who fear the humans and plan to destroy them. Jim Cummings as Chowquin, Cale's overseer at the salvage yard. Charles Rocket as Firrikash, a salvage yard worker who bullies Cale. Charles Rocket also voices a Slave Trader Guard who surprises Preed with his intelligence. Ken Hudson Campbell (credited as Ken Campbell) as Po, a salvage yard worker who bullies Cale. Roger L. Jackson as the First alien. In development at 20th Century Fox since 1998, Titan A.E was originally going to be a live-action film. The script had been passed around to various writers such as Ben Edlund, Joss Whedon and Art Vitello. After $30 million had been spent in the film's early development with no progress, Art Vitello was sacked. Then-chairman of 20th Century Fox Bill Mechanic then gave the script to Fox Animation Studios creative heads Don Bluth and Gary Goldman, who were fresh from the success of their recent film Anastasia (1997). Mechanic had no scripts for Fox Animation Studios to work on and was faced with the choice of laying off the animation staff unless they took Titan A.E. Despite their inexperience with the science fiction genre, Bluth and Goldman took the script regardless. Fox Animation Studios was given a production budget of $75 million and 19 months to make the film. Unlike Bluth and Goldman's previous films, the animation in Titan A.E. is predominantly computer-generated while the main characters and several backgrounds were traditionally animated. Many of the scenes were enacted by the animation staff using handbuilt props before being captured by a computer. Many scenes and backgrounds were painted by concept artist Paul Cheng, who had worked on Anastasia and its direct-to-video spinoff Bartok the Magnificent (1999). Much like Anastasia, the storytelling and tone in Titan A.E. is much darker and edgier than Bluth and Goldman's previous films with the film being regularly compared to Japanese anime. Although Bluth and Goldman denied any influence by anime, they have acknowledged the comparison. During production of Titan A.E., Fox Animation Studios suffered a number of cutbacks which ultimately led to its closure in 2000. Over 300 animation staff were laid off from the studio in 1999 and as a result, much of the film's animation was outsourced to a number of independent companies. Several scenes were contracted to David Paul Dozoretz's POVDE group; the "Wake Angels" scene was animated by Reality Check Studios (their first feature film work) while the film's "Genesis" scene was animated by Blue Sky Studios, who would later go on to making 20th Century Fox's Ice Age and Rio film franchises as well as The Peanuts Movie (2015). Under pressure from executives, Bill Mechanic was dismissed from 20th Century Fox prior to Titan A.E. 's release eventuating in the closure of Fox Animation Studios on June 26, 2000, ten days after the film's release. All these events stunted the film's promotion and distribution. On November 24, 1997, Matt Damon joined the cast of the film along with Bill Pullman, Drew Barrymore, Hank Azaria, Nathan Lane, Jim Breuer, Janeane Garofalo and Lena Olin joined the cast of the film. Later, John Leguizamo joined the cast. Azaria was cast as "Ship's Navigator" but was cut from the film. The soundtrack to Titan A.E. was released on audio cassette and CD by Capitol/EMI Records on June 6, 2000 and featured 11 tracks by various contemporary rock bands, including Lit, Powerman 5000, Electrasy, Fun Lovin' Criminals, The Urge, Texas, Bliss 66, Jamiroquai, Splashdown, The Wailing Souls and Luscious Jackson. Creed's song "Higher" was played in many of the theatrical trailers for Titan A.E., but the song did not appear either on the soundtrack or in the movie itself. The film's score was composed and conducted by Graeme Revell, although an official album containing the film's underscore was originally not released alongside the film. On October 23, 2014, the film's score was made available for the first time by La-La Land Records, released as limited edition CD of 1,500 copies, containing most of what Revell wrote for the feature. It contains 32 tracks and music cues, including two bonus tracks: an orchestra-only version of "Creation" and an alternative version of "Prologue" with a different opening. Titan A.E. became the first major motion picture to be screened in end-to-end digital cinema. On June 6, 2000, ten days before the movie was released, at the SuperComm 2000 trade show, the movie was projected simultaneously at the trade show in Atlanta, Georgia as well as a screen in Los Angeles, California. It was sent to both screens from the 20th Century Fox production facilities in Los Angeles via a VPN. Titan A.E. was released on VHS and "Special Edition" DVD on November 7, 2000 by 20th Century Fox, which contains extras such as a commentary track by Don Bluth and Gary Goldman, a "Quest for Titan" featurette, deleted scenes, web links, and a music video for Lit's "Over My Head". The region 1 North American version also comes with an exclusive DTS English audio track in addition to Dolby Digital 5.1 featured in most international releases. Chris Carle of IGN rated the DVD an 8 out of 10, calling the movie "thrilling... with some obvious plot and character flaws" but called the video itself "a fully-packed disc which looks and sounds great" and "for animation and sci-fi fans, it's a must-have." As of 2019, the film has yet to released on Blu-ray. The film opened at #5, with $9,376,845 for an average of $3,430 from 2,734 theaters. The film then lost 60% of its audience in its second weekend, dropping to #8, with a gross of $3,735,300 for an average of $1,346 from 2,775 theaters. The film ended up grossing only $36,754,634 worldwide ($22,753,426 in the United States and Canada, and $14,001,208 in international markets). The film's budget is estimated at between $75 million and $90 million. According to Chris Meledandri, the supervisor of the film, Titan A.E. lost $100 million for 20th Century Fox. 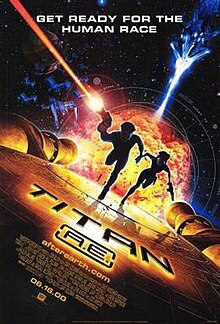 On Rotten Tomatoes, Titan A.E. has an approval rating of 51% based on 100 reviews with an average rating of 5.7/10. The site's consensus reads, "Great visuals, but the story feels like a cut-and-paste job of other sci-fi movies." On Metacritic the film has a score of 48 out of 100 based on 30 reviews, indicating "mixed or average reviews". Audiences polled by CinemaScore gave the film an average grade of "A-" on an A+ to F scale. Roger Ebert gave the film 3.5 stars out of 4, praising it for its "rousing story", "largeness of spirit" and "lush galactic visuals [which] are beautiful in the same way photos by the Hubble Space Telescope are beautiful". He cited the Ice Rings sequence as "a perfect examine [sic] of what animation can do and live-action cannot". Titan A.E. won a Golden Reel Award for "Best Sound Editing for an Animated Feature", and was nominated by the same organization for "Best Sound Editing for Music in Animation", and a Satellite Award for "Best Motion Picture, Animated or Mixed Media", losing both to Chicken Run. The film was also nominated for three Annie Awards, including "Outstanding Achievement in An Animated Theatrical Feature", "Effects Animation", and "Production Design" which it lost to Toy Story 2 and Fantasia 2000, respectively, and was nominated for Best Science Fiction Film at 27th Saturn Awards, but lost to X-Men, another film from 20th Century Fox. Drew Barrymore was nominated for "Best Voice-Over Performance" by the Online Film & Television Association for her role as Akima but was beaten by Eartha Kitt from The Emperor's New Groove. Outstanding Achievement in An Animated Theatrical Feature Titan A.E. A video game adaptation by Blitz Games was planned to be released for the PlayStation and PC in Fall 2000 in North America, following the film's summer release. Development on both platforms had begun in March 1999 under the film's original title Planet Ice, and an early playable version was showcased at the 2000 Electronic Entertainment Expo in Los Angeles. In July 2000, a spokesman from the game's publisher Fox Interactive, announced that development on the title had been halted largely due to the film's poor box office performance which was "only one of many different factors" that led to its cancellation. To tie-in with the film, two prequel novels written by Kevin J. Anderson and Rebecca Moesta were released on February 10, 2000 by Ace Books, the same day the official novelization of the film written by Steve and Dal Perry was released. A Dark Horse Comics comic series focusing on the character Sam was also released in May 2000. Titan A.E. : Cale's Story - The adventures of Cale, ending with the beginning of the film. The book chronicles Cale growing up on Vusstra (Tek's home planet) for ten years and having to move to a different place every time the Drej attack. It also reveals how Cale became resentful of his father's disappearance and how he came to despise "drifter colonies". Titan A.E. : Akima's Story - The adventures of Akima, ending with the beginning of the film. The book chronicles Akima's life aboard drifter colonies and also reveals where she learned her karate skills, her friendship with Stith and her reason to find the Titan. Titan A.E. : Sam's Story - A three-issue comic book series telling the story of Sam Tucker, his crew and their quest to hide the Titan. ^ a b c d "Titan A.E." Box Office Mojo. Retrieved April 11, 2015. ^ a b Palmeri, Christopher (September 19, 2013). "Despicable Me 2 Producer Knows How to Win the Box Office". Bloomberg. Retrieved April 11, 2015. ^ Gabbi Shaw (February 27, 2017). "The biggest box office flop from the year you were born". Insider. Retrieved June 21, 2018. ^ a b Lauria, Larry (June 1, 2000). "A Chat With Don Bluth And Gary Goldman (Part I)". Animation World Network. Retrieved December 18, 2015. ^ Backes, Evan (April 1, 2001). "Why Does It Take Ten Years!?!". Animation World Network. Retrieved April 25, 2017. ^ a b "DON BLUTH at AnimationNation.com Special Event 2010". AnimationNation. May 21, 2014. Retrieved December 18, 2015 – via YouTube. ^ "Paul Cheng - Titan A.E." Paul Cheng.com. Retrieved December 18, 2015. ^ Linder, Brian (June 27, 2000). "Fox Animation Studios Closes Its Doors". IGN. Retrieved December 18, 2015. ^ "Reality Check Studios Tapped for Tricky Titan AE Sequence". ^ Fleming, Michael (November 24, 1997). "Fox's 'Ice' taps hot stars". Variety. Retrieved October 14, 2017. ^ a b "Titan A.E. - Original Soundtrack". AllMusic. Retrieved October 23, 2015. ^ Mendelson, Scott (February 16, 2016). "Terrific New 'Alice Through The Looking Glass' TV Spot Will Give You Pink Eye". Forbes. Retrieved December 11, 2016. ^ a b "Titan A.E. - Graeme Revell - Limited Edition". La-La Land Records. Retrieved October 23, 2015. ^ "Digital Cinema Delivered in Internet Style" (PDF). Cisco Systems. 2000. Archived from the original (PDF) on September 28, 2007. Retrieved October 24, 2014. ^ "Titan A.E. [VHS]". Amazon. Retrieved October 25, 2015. ^ "Titan A.E. (2000)". Amazon. Retrieved October 24, 2015. ^ a b "Titan A.E. (2000)". DVDCompare. Retrieved October 24, 2015. ^ Carle, Chris (November 15, 2000). "Titan A.E." IGN. Retrieved October 24, 2015. ^ "Titan A.E. - Weekend Box Office Results". Box Office Mojo. Retrieved April 11, 2015. ^ W. Welkos, Robert (June 12, 2000). "Animated Clash of the 'Titan'". Los Angeles Times. Retrieved April 11, 2015. ^ "Titan A.E. (2000)". Rotten Tomatoes. Retrieved October 23, 2015. ^ "Titan A.E. Reviews". Metacritic. Retrieved July 1, 2018. ^ Ebert, Roger (June 19, 2000). "Titan A.E. Movie Review & Film Summary (2000)". RogerEbert.com. Retrieved October 24, 2015. ^ "MPSE: Golden Reel Feature Film WINNERS! - 48th Annual Awards - for year of 2000". Motion Picture Sound Editors. Archived from the original on December 10, 2001. Retrieved October 23, 2015. ^ "MPSE: Golden Reel Feature Film nominations - 48th Annual Awards - for year of 2000". Motion Picture Sound Editors. Archived from the original on May 14, 2003. Retrieved October 23, 2015. ^ "Satellite Awards (2001)". IMDb. Retrieved October 23, 2015. ^ "28th Annual Annie". Annie Awards. Retrieved April 11, 2015. ^ "X-Men Leads Sci-fi Awards Pack". ABC News. April 4, 2001. Retrieved April 11, 2015. ^ "Online Film & Television Association (2001)". IMDb. Retrieved October 23, 2015. ^ a b Perry, Douglas C. (June 22, 2000). "Titan A.E." IGN. Retrieved December 9, 2015. ^ Gestalt (November 8, 2000). "Philip Oliver of Blitz Games". Eurogamer. Retrieved December 9, 2015. ^ "Titan A.E. Canned". IGN. July 26, 2000. Retrieved December 9, 2015. ^ a b Chitwood, Scott (February 10, 2000). "Titan A.E. Prequel Novels and Novelization in Stores". IGN. Retrieved October 24, 2015. ^ a b Chitwood, Scott (May 22, 2000). "A Look at the Titan A.E. Prequel Comic". IGN. Retrieved October 24, 2015. ^ Chitwood, Scott (February 10, 2000). "A Quick Review of Cale's Story". IGN. Retrieved October 24, 2015.